PLEASE DESCRIBE WHO OR WHAT INFLUENCED YOUR DECISION TO JOIN THE AIR FORCE? Two things actually; I was going to a Junior College at the time. One evening, the discussion at the dinner table got some of my wheels turning. First my girl friends Father (who later became my Father In Law) recommended the Air Force to me, since He was in the Army Air Corps. And secondly, in 1969 I registered for the draft, which was a requirement. I had a student deferment, however, I also had a very low lottery number. There was a draft for military service, and at the same time, there was a new lottery system in place. Not having any idea how this system worked, but being able to determine that I had a very low number, it was inevitable that I would be going into the military soon. Since the Vietnam War was in full swing, and not wanting to go into the Army I decided to enlist in the Air Force. I would pursue my college later, which I did. And believe it or not, I actually had a very honest recruiter. He helped me prepare for the entrance exam. I scored well enough and I was able to get my first choice of Aircraft Maintenance. I was originally going to be assigned to Norton AFB in Southern California to work on C-141s. A couple weeks before I was to leave Chanute AFB, I received an amendment to my original orders, now sending me to Travis AFB, California to work on C-5’s. That one particular evening discussion was one of the best things that has ever happened in my life. Looking back, any member of my family that could serve, did serve, dating back to the Revolutionary War. It was my duty, and it was an honor. I started out as a Aircraft Maintenance Specialist, Jet over 2 Engines. This training was at Chanute AFB, IL. After completion of this training, I was assigned to the C-5 Galaxy, 60th OMS at Travis AFB. This was the most beautiful Aircraft I have ever seen. I knew that one day I would become a flight engineer on this aircraft. So after about 6 years, I had an opportunity to fly as a crew chief. After a year of flying I applied to retrain as a Flight Engineer. And this is where my Air Force career progressed. After flying for about 3 years, in the 22 MAS, I applied for instructor duty for the 56th MAS, at Altus AFB, OK. This is where I really learned a lot about the C-5, the systems, and teaching people. I was stationed at Altus just short of 4 years. While at Altus I was able to further my education by attending the local college in town, in addition to attending the education program on base with Southern Illinois University. 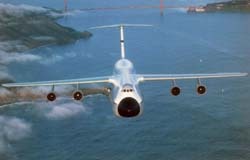 While considering a PCS move back to Travis, I flew the first C-5 B Model, 83-1285. It was at this time I had my choice of assignments, to go anywhere, on any aircraft. I decided that my loyalty should remain with the C-5. Returning to the 22 MAS at Travis, I was given the task of being the Chief of Flight Engineer Training. I was in this position for 4 years. As I was approaching 20 years of service, and having some discussions with my family I decided to retire based on my age at the time. I thought I’d have a better chance starting a new career at age 38/39 versus 45/48. IF YOU PARTICIPATED IN COMBAT, PEACEKEEPING OR HUMANITARIAN OPERATIONS, PLEASE DESCRIBE THOSE WHICH WERE THE MOST SIGNIFICANT TO YOU AND, IF LIFE-CHANGING, IN WHAT WAY. It was 1974; I received the Humanitarian Service Medal for participation in Operation Baby Lift. This involved evacuating people from Vietnam. We lost one of our C-5’s during this operation, C-5A 68-218, however, I think overall, it was a success. 68218 was originally assigned to Dover, AFB Delaware. However, someone made a suggestion, or decision to trade 68218 for C-5A 69021 in 1972/1973. I was an Aircraft Maintenance Specialist during this time. I was assigned to 021. 69021 was a flyer and a real clean Airplane. It was well taken care of. When the trade went down, and 68218 arrived on station, it was a mess. And that’s an understatement. So I was now assigned to 218. In the early days of the C-5’s, there was not a refurb group/team at Travis AFB. So 218 went into an immediate refurb. This task was completed by our small team of about 5 people. I was assigned to 218 for about 1 1/2 to 2 years. When I became a flying crew chief, I flew with some of the crew members from the Saigon Crash. As a flight engineer, when I transferred to Altus AFB, I flew with the Co-Pilot from 218. He was our Operations Officer. I flew all over the World. It always gave me great pleasure and honor to help people in need. It just made me a better person. Altus AFB, Oklahoma was my favorite.This is where I developed into a very good Instructor Flight Engineer. The resources were in place as far as having very experienced Instructor’s. I could talk to people either at TTU, Technical Training Unit, basically the classroom environment, (CMSgt Buck Buchannon) or anyone in our flying squadron. CMSgt Ron Snyder, CMSgt Jim Eakins, CMSgt Charlie Andersen. There was never any pressure from anyone for needing a little remedial training. I don’t have a least favorite. I was only stationed at Travis, & Altus. But I flew all over the World. Almost every place I flew into was a challenge, because they were all different, and each an every airlift mission was different. My Leadership School, & NCO Academy Training. My Leadership School was at Norton AFB, CA, while my NCO Academy was at Lackland AFB TX. These two courses gave me some extremely good people skills. Both oral and written communication. Outstanding Instructors and group workshops. These schools helped develop me for the future. With the foundation being poured for me, I was able to transition successfully from the Air Force after 20 years when I went to work for Chevron USA for 14 years, and later Union Pacific Railroad for 10 years. I trained many people with Chevron. I wrote and up-dated plant procedures for the 2 refineries I was assigned, Richmond, CA & El Paso, TX. When I went to work for UP, I became an Instructor for HR. I instructed Locomotive Engineers, Conductors, & Brakemen in the classroom as well as the field. I traveled & trained all over the United States. WHAT ACHIEVEMENT(S) ARE YOU MOST PROUD OF FROM YOUR MILITARY CAREER? Receiving my Meritorious Service Medal. I was Chief of Flight Engineer training in the 22 MAS for 4 years. My goal was; I wanted to prepare my student’s for the day when they would be on their own. We were also starting to receive the new C-5 Galaxy B models. With that there seemed to be more focus on the new airplanes. So I was able to coordinate and schedule my students with C-5A training classes at the FTD School on Travis. When I wasn’t flying, I would take a group of students to each shop on base. They were able to see first hand the many components that they would interact with, discuss the parameters with each specialist, and have a better understanding how it all fit together and worked. We also would go to the ISO Docks and see the airplane in its skeleton form as most of the panels were removed. After each field trip so to speak, the students light bulbs would shine brighter. The Chief Trainer from the 75th MAS and myself combined our resources and were able to schedule an Airplane each week from maintenance with live systems. Short of starting engines, this was a huge success. In a nut shell, this decoration was for all of my training efforts with my students. OF ALL THE MEDALS, AWARDS, QUALIFICATION BADGES OR DEVICES YOU RECEIVED, PLEASE DESCRIBE THE ONE(S) MOST MEANINGFUL TO YOU AND WHY? All of my awards & decorations mean a lot to me. Some stand above others. I am very proud/honored to have received my Meritorious Service Medal. This was in recognition for all of my training accomplishments. I am also very proud of my Chief Aircrew Member Badge, and I am equally as proud of my Senior Maintenance Badge. Originally, there was no type of Badge for maintenance people. If memory serves me correctly, these Badge’s did not come out until the late ’80’s. I am also proud of my Marksmanship Ribbon. I shot expert with both the long rifle and pistol. Dennis Riehl, CMSgt Retired, Calvin Takenaka, MSgt Retired, Ron Bretherick, MSgt Retired. These three were part of the original 28 C-5A Test Team Crew Chiefs. They were on the C-5A Test Team at Edwards AFB. They would be assigned to the 60th OMS. I later flew with Ron while we were stationed at Altus AFB. And from time to time, I would see both Dennis & Calvin out in the system. It was very reassuring to see them with the Aircraft that I was scheduled to fly on. Calvin Takenaka gave me one of his Test Team Patches. The other was the original 60 OMS patch. CMSgt Art Kaveck; When I applied to retrain to become a flight engineer, I was interviewed by Chief Kaveck. He didn’t sugar coat the career field. He explained all of the worst things that could happen. This was a unique approach. After I retired, Art called me up at home and asked if I would be interested in teaching part time in the simulator. I said, “absolutely”. CMSgt Ken Brooks. He was my first Branch Chief, Superintendent, when I was assigned to the 22 MAS. We flew together one time, and I will always remember that trip. CMSgt Jim Eakins. My first Branch Chief, Superintendent, when I was assigned to the 56 MAS, Altus AFB, OK. After retraining as a flight engineer, I had gone TDY to Altus for inflight refueling training. I met CMSgt Eakins on several occasions. Ultimately, it was his decision enabling me to be assigned to Altus. Additional People-Darrell Sandlin, David Kline, John Moran, Bill Duvall, Don Hoyer, Bill Mattingly, Dan Heffron, & Jim Hollis-These are all C-5A Test Team Crew Chiefs. Senior NCO’s, Paul Thomas, Oliver Merrill, (Ollie) Leon Rode, Jerry Campbell, Ron Snyder, Steve Jarnigan, Mike O’Neil, & Paul Feuz. Bob Starchman, Jim Stockley, two great Engine Mechanics & Flight Engineers. Each one of these individuals had the knowledge and experience, and by working along side them, talking to them, this helped me out tremendously. They payed if forward to me, and I did the same as well. I may have missed some people, with this I apologize. 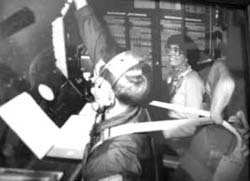 Part of the Aircrew Training requirement was to have altitude chamber training, initially & then every three years. This training focuses on the physiological aspect of the human body. One area is to learn your Hypoxia symptoms. While on a particular mission, with C-5A 68228, we were just a basic crew, meaning there were just two flight engineer’s assigned. During one leg, I was the scanner, & during climb out, I was performing my duties when I noticed one of the oxygen doors in the troop compartment lavatory had fell open. Thinking this to be very unusual and the door possibly having a bad latch, I closed the oxygen mask door. Several minutes later when I was about to go back to the flight deck, the door opened again. I again reached over to close the door, and started on my way back. As I turned around, I saw all 25 mask door’s open, started to feel my hypoxia symptoms, and knew this was for real. I calmly picked up a portable oxygen bottle, and checked in with the flight deck. Once I arrived on the flight deck, I was able to troubleshoot our problem, correct the situation, check our remaining fuel and determine with the Aircraft Commander that we would be able to make it to our next station without having to make an emergency landing. The local Center was working with us and in any minute would have given us a direct flight path to any field for an emergency landing. Training can sometimes get in the way of your daily routine, but to stay sharp in any job, training is essential. I am thankful for all of those chamber rides, including those hours in the classroom learning the physiological aspects of the human body. This still makes me laugh to this day. As I may have mentioned earlier, I would have loved to stay in the Air Force forever, if it were possible. In my opinion, my age was starting to become a factor for me to start another career. So I decided to leave the Air Force. My initial plan was to continue flying for a major airline. I had many interviews and was just waiting for the phone to ring. Then the first Gulf War started. With this, all airline hiring was frozen. So my wife had noticed an advertisement in our local paper for refinery operators. So I applied to Chevron, in Richmond, California. I went to work for Chevron USA at the Richmond Refinery. I was an operator, both inside & outside. I was an integral part in manufacturing motor oil at the Richmond Refinery. After about 7 years, I transferred to El Paso,Texas. I went from a huge refinery, to a small Asphalt Plant. I worked for Chevron for 14 years, and then went to work for Union Pacific Railroad. I was a licensed conductor, remote control operator, & locomotive engineer for the first few years, and later became an Instructor. I traveled all over to different terminals teaching rules, and procedures. I am now retired. AFSA, Air Force Sergeants Association. Keeping up with current events for military members. Always looking forward to my monthly news letter. Air Force Together We Served. This is very new to me. However, it has allowed me to re-connect with past service members. And it has given me a proud reflection of my career. Many ways; time management, discipline, being a good planner, interaction with other people. All of these skills have helped me both in my career’s after the Air Force, and at home as a husband, father, & family man. There were extremely long days/nights/shifts/flights while in the Air Force. When I went to work for Chevron and Union Pacific, it was one thing that I did not have to get use to. Long days/nights were not new to me. Accomplishing the near impossible; My photo here in 1977 shows 668306 with only 3 engines. 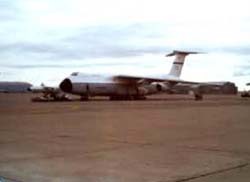 This C-5 was damaged in November of 1976 by a Pylon Fire. It was temporarily repaired and cleared for a 1 time flight to Marietta, Georgia, to be completely repaired by Lockheed. Point being, you can accomplish anything. Stay focused, and never quit. BASED ON YOUR OWN EXPERIENCES, WHAT ADVICE WOULD YOU GIVE TO THOSE WHO HAVE RECENTLY JOINED THE AIR FORCE? Respect your superior’s, respect each individual, follow orders & direction well. Help the weak or slow persons. Don’t look the other way by ignoring them. Don’t take any shortcuts & don’t ever be afraid to ask a question. Serving in the military is a good foundation builder for life in the future. It will make you a better person. I know it can be difficult for some people to look ahead 20 or more years. Try to have those short and long term goals. Where you start out in the military may not be where you want to finish. You can always retrain, but try to put yourself in a position for an easy transition from the military to civilian life. You can do anything if you put your mind in to it. If you’re told you can’t, don’t stop. Pursue it. First let me say that until late 2014 I was not aware of TWS. My former companies frowned upon its employees searching any type of social media or internet site while at work. I can respect that, since I have learned several people from various companies, organizations have either been disciplined or fired from inappropriate comments. This is one area that I always touched on with my students at Union Pacific. So after finally retiring altogether, I discovered TWS from a flight engineer on Facebook. So I joined. This has allowed me to record many things electronically, which I am proud of, and get in touch with former people that I worked with, and flew with. It ‘s a work in progress. I have also enjoyed recruiting several people, which gives me a great deal of satisfaction. With that said, I hope my career will have an impact on current military members in the future. Best of luck with all of your aspirations and travels.